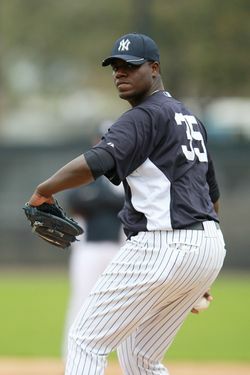 Our preview of the 2012 Yankees season continues with a look at who will make up the rotation this year. When the Yankees traded for Michael Pineda and signed Hiroki Kuroda back in January, the team had seven pitchers competing for five rotation spots, and it was generally understood that four of those spots would be occupied by CC Sabathia, Ivan Nova, Pineda, and Kuroda. A month later, A.J. Burnett was shipped off to Pittsburgh, and the picture seemed a bit clearer: It looked like the battle for the fifth and final spot would come down to Phil Hughes and Freddy Garcia. Then Andy Pettitte un-retired and signed a minor-league deal, complicating things further. Then Pineda got hurt, leaving the Yankees with five starting options to start the season and solving things for the time being, though only delaying the decisions Joe Girardi and Brian Cashman will eventually have to make. It's worth remembering that Garcia can't be sent to the minors without his approval. Hughes, meanwhile, pitched well as a starter this spring, so there's hope he'll bounce back from a disappointing 2011. And don't forget: Nova was sent down to the minors to make room in the rotation last year, even though he'd been pitching well for the Yankees at the time. So perhaps Nova would be the odd man out, if they want to keep Garcia in the rotation. Of course, when Pineda is ready to return to the majors, they'll need to make yet another decision. At that point, however, Garcia could be a natural candidate to be traded, since one extra starting option is already something of a luxury. After all, Garcia was originally brought into battle for a rotation spot last year, and unlike the other guys fighting for a starting job this year, he doesn't figure into their long-term plans. That still leaves six men for five jobs, which is where things get really tricky, especially if Hughes — who has experience pitching out of the bullpen — pitches well as a starter once the season begins. If, for argument's sake, Hughes is effective as a starter, would the Yankees really demote him to a bullpen that, if all goes according to plan, already has the seventh, eighth, and ninth innings covered? It's hard to believe they would. It's more likely that no one's job is safe, beyond Sabathia and presumably Kuroda (who, just as a reminder, is 37 and moving from the N.L. West to the A.L. East). Remember: There was talk of Pineda — who'd been struggling with his velocity before landing on the disabled list — starting the season in the minors before he got hurt. We have no doubt he'll get his chance to start once he's healthy, but if he struggles (and, say, if Nova pitches well), one would think a midseason demotion to the the Scranton/Wilkes-Barre/Empire State Homeless Yankees (or whatever they're calling their triple-A squad these days) would at least be an option. Of course, as we've already learned this spring, injuries can change everything — while also reminding us why the Yankees don't really mind having an abundance of arms.